Ah, The Daily Beast. 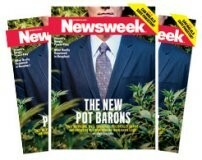 Alongside such in-depth journalism as "Kim Kardashian's Not a Fan of Underwear, Shows Off Crack" we have their syndicated Newsweek cover "The New Pot Barons" - a classic bit of jaundiced East Coast gawking — this time at the medical marijuana industry of Colorado — framing the industry like this big get-rich-quick scheme. "What I saw in Colorado was ... the Sergey Brins and Mark Zuckerbergs of the Green Rush [ed note: Jesus]. They could have done almost anything with their lives—'my brother is a physician' is the kind of thing one hears from them—but they chose to enter the pot business because they see it as a boom market, miracle cure, and social movement decades in the making and suddenly, thrillingly, near." They toss in the Big Tobacco conspiracy theory: "Peter Bourne, the drug czar under Jimmy Carter, recently told Newsweek that tobacco executives shared their marijuana contingency plans with him. ...The alcohol and tobacco industries traditionally get 80 percent of their profits from heavy users, and there’s every reason to believe that marijuana sellers will need the same ratio. That would mean Colorado’s burgeoning pot business could be the basis for a third huge, blood-sucking vice industry, dependent on converting kids and supporting heavy users. ... It was easy to see my hosts 30 years from now, when legalization is here, sitting in the same woozy affluence—fatter, balder, and famously rich." If no one prints it, is it a Newsweek cover? "Because Arbelaez and Salfeld, and the rest of the industry, are technically felonious under federal law, they struggle for basic business services. Banks and landlords hesitate to take their money. They can’t get traditional loans, or insurance, or health coverage. Credit-card companies won’t process transactions in their stores. Judges won’t enforce their contracts. The IRS forbids normal business deductions, bankrupting many operations. But that’s the only deduction allowed. "'Not a whole lot of money is being made,' says Arbelaez. That's some "pot baron" you got there.